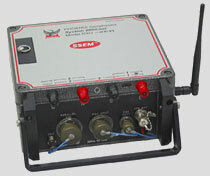 The RXU is a 2- or 3-channel (E) receiver used in a network of V8 and RXU instruments. 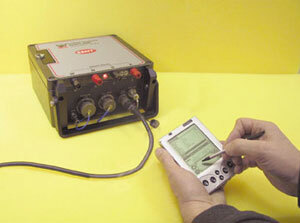 The RXU provides an infrared interface to allow setup and monitoring from Palm OS® handheld devices. When (optionally) radio-enabled, the RXU can also be set up and monitored from the V8 over the wireless network. The RXU uses the same data acquisition software and the same on-board processing software as the V8. When radio communication is established, the RXU transmits its statistics to the V8 over the network, while simultaneously saving the data on disk for post-processing. See the V8 Wireless System for more information.